Consider this. If you could affordably construct a billboard on every important road for your business, would you do it? With the internet it’s possible. With internet marketing we essentially help businesses position themselves in front of potential customers and clients where they’re looking. We give your business the opportunity to build those billboards. We know the roads. We have the tools. Committing to an ongoing internet marketing strategy is essential so you’re positioned in the right places. Each month more and more people are using the internet and their mobile phones to research and find what they need. With an ongoing strategy you’ll show up in front of your customers where they’re searching and you’ll likely see steady growth. If you don’t commit you’ll be missing opportunity after opportunity. 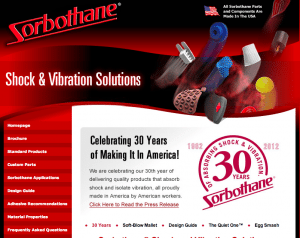 Our client Sorbothane® is recognized worldwide as the ultimate material for attenuating shock, isolating vibration and damping noise. Since its introduction in 1982, Sorbothane® has been used in many energy absorbing product applications including Wilson Sporting Goods, the transportation of the Liberty Bell, The Air Force Memorial structure in Washington and on The Space Shuttle just to name a few. We’ve been working with Sorbothane for many years. Our #1 objective is to increase their visibility online so when someone has a problem that they’re trying to solve, we can position Sorbothane where they’re looking. The graph below shows their traffic growth trend over the last 3 years. 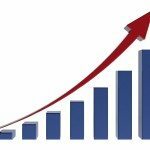 Organic internet marketing takes time so it’s important to measure success year over year. It’s like watching your financial investments on a monthly basis. It can drive you crazy. What you want to do is look at the trends over time where you’ll likely see success or failure. What’s happened over the years is steady growth. Their traffic is on a consistant upward trend year over year and it just keeps heading north. First, I think it’s essential to continually work on all the important things that are necessary to increase visibility organically and never stop. (By organic I mean that we get listed in the free listings on the search engines.) Organic growth won’t happen without consistent work. Again, think of it as a series of billboards on many roads. If we’re targeting two key phrases for Sorbothane like “visco-elastic material” and “vibration isolation material”, these are essentially two completely different roads. You can’t have visibility on these roads without building several unique billboards over time. The chart above shows what commitment will get you. 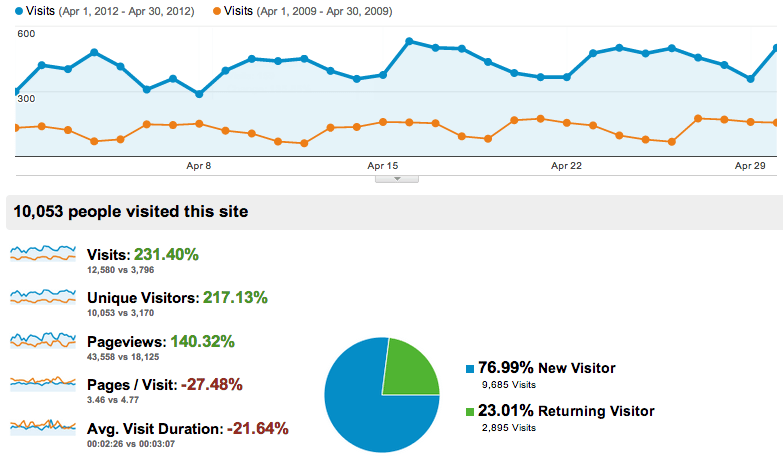 This graph shows traffic in April 2009 compared to traffic in April 2012. 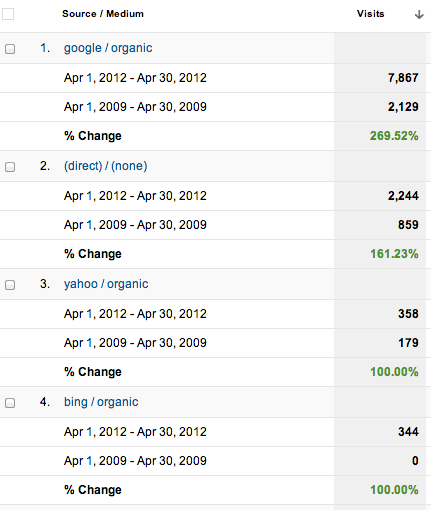 This is a direct result of committing to organic search marketing and continually working hard every month. What we’re showing here is almost +232% growth! 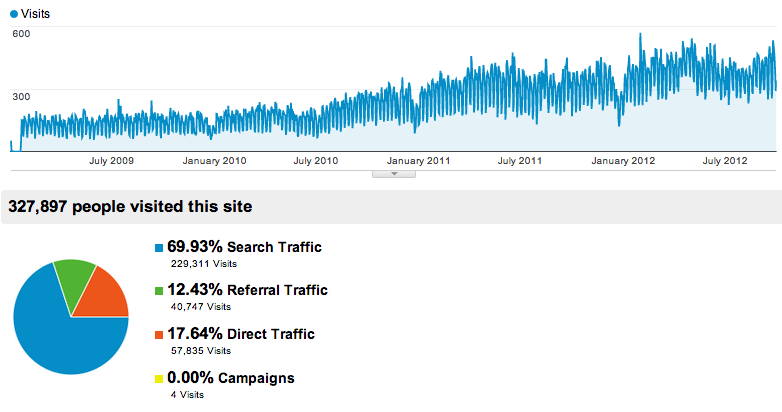 Visits to the site went from 3796 in 2009 to 12,580 in 2012 with steady work. This is an investment that will keep on giving! Google likes to see sites that are continually updated. What this shows is, first, the business is still viable. Businesses disappear every day so this is the first signal that they use to determine if you’re heart is still beating. Second, consistency shows that you’re continually trying to build a better resource for your customers. Google wants to point their searches to the best content and resources available on the internet. If you’re continually adding new content this is a great signal to send to Google. Third, there are potentially thousands of different ways to search for and describe what you do. Just building a website with a few pages will never tap the potential that you have available to you. As mentioned in the previous example, Sorbothane would never rank for two completely different terms if we didn’t work on these terms individually. They simply wouldn’t be on the radar. It takes consistent work from month to month to put up all those billboards that route customers to your website. Organic search marketing involves tactics that increase the websites’s visibility in the “free” search results on Google. An organic approach is important because it’s a great investment. When you invest in organic search marketing, you’re investing in your future website traffic — you’re building billboards online on all the roads that people travel. The chart below shows “organic traffic” to the Sorbothane.com website. As you can see we’re tracking traffic from the top 3 search engines. Organic search engine traffic to the site is over 75% of total traffic to the site. Other traffic comes in from direct traffic (typing in their URL) and other sources like referrals from other websites. Since Google is the dominant search engine it will likely deliver the most traffic as is evident here. With traditional advertising or even other internet marketing methods, if you stop paying the piper, you disappear. With a consistent, committed organic marketing strategy you’ll have your billboards established (rankings for your website) and you’ll be on the radar. If you ever need to stop paying for the service you’ll likely retain your traffic. It really is the best investment that you can make in your website and business.